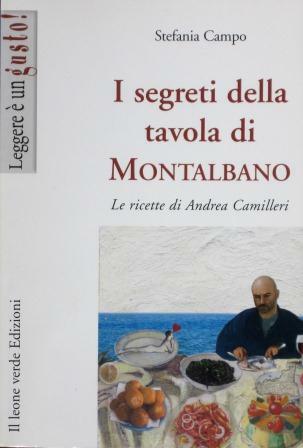 I am a big fan of Andrea Camileri’s books featuring Inspector Montalbano. The stories are set in southeastern Sicily in a town with a made-up name, but it sounds a lot like Agrigento. This is of interest to me because my father’s family comes from this area. Montalbano, like most Sicilians, spends a lot of time thinking, talking about and eating food. Especially seafood. Wine and food writers Diane Darrow and Tom Maresca are also loyal fans of the Inspector Montalbano books as well as the made-in-Italy television series on the same subject which is available here on dvd. Diane and Tom invited Michele and I to a dinner at their home featuring recipes from a cookbook, The Secrets of Montalbano’s Table (I Segreti della Tavola di Montalbano), written by Andrea Camilieri. Tom paired the dishes with wines from Mt. Etna in Sicily–mostly. 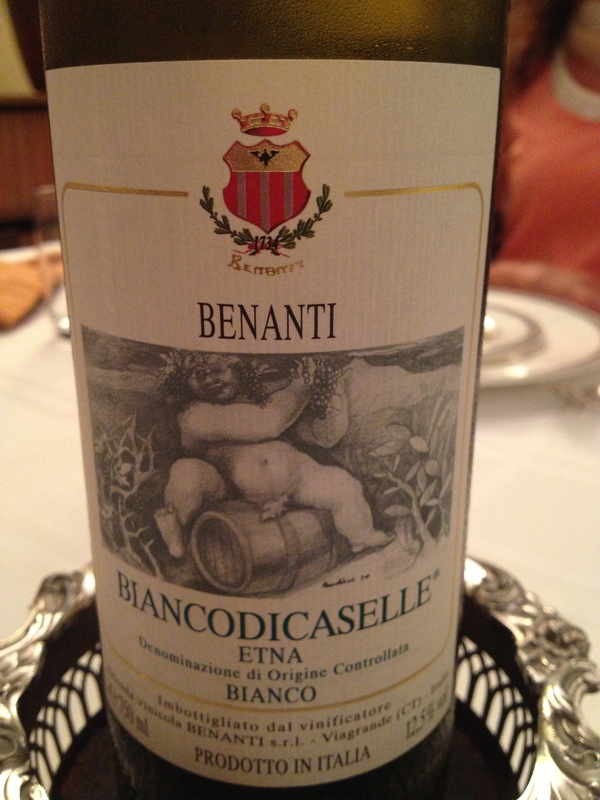 Etna Bianco Biancodicaselle 2010 DOC Benanti made from 100% Carricante, vines grown as freestanding bushes-alberello. This indigenous vine is cultivated only on Mt. Etna. The vines are 35 to 50 years old and at 800 to 1,000 meters. The area of production is the countryside of Caselle on the eastern slope of Etna in the commune of Milo and the countryside of Cavaliere on the southern side of the mountain, in the commune of Santa Maria di Licodia. The soil is sandy, volcanic, and rich in minerals, with subacid reaction. The consulting enologist is Michele Bean. The grapes are late ripening and are picked in the third week of October; they are intact and softly pressed. Temperature controlled fermentation in stainless steel vats. The wine matures for a certain period of time in tanks before being bottled. After two months in bottle the wine is released. The color is pale yellow with greenish hints; it is aromatic, fruity with hints of apple, and nice acidity. 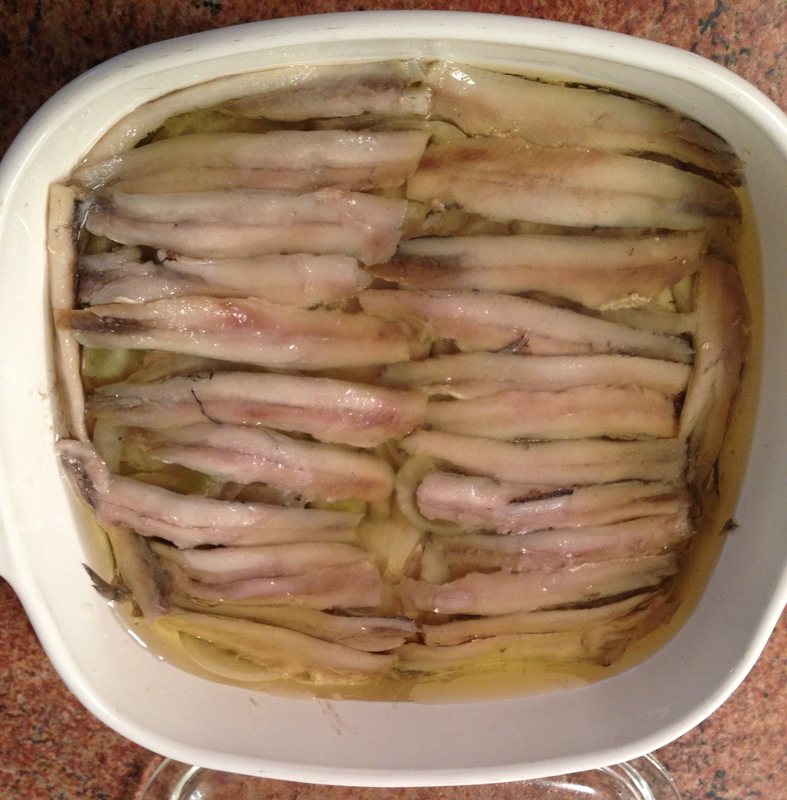 This was paired with Alici con Cipolle e Aceto, fresh anchovies marinated in white wine and vinegar with sweet cipollini onions. I love alici and it was a great. 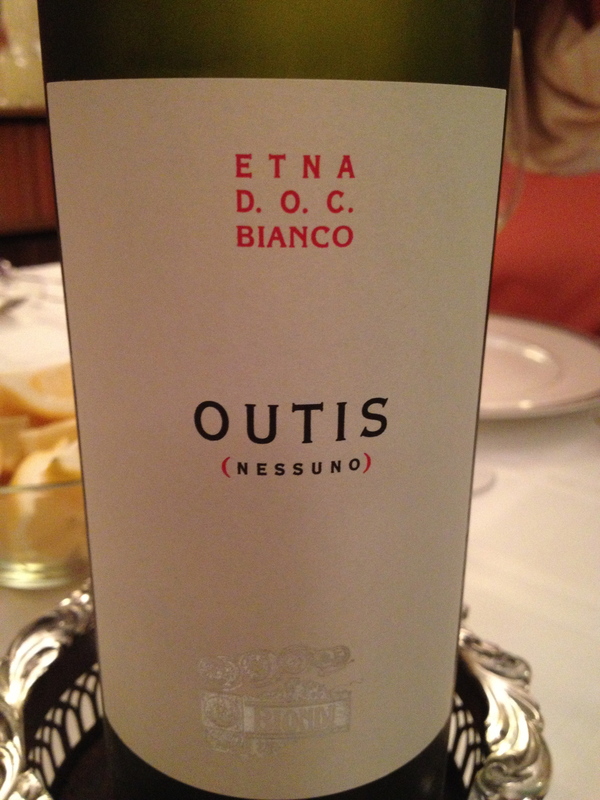 Etna Bianco Outis (Nessuno) 20o9 DOC Vini Bondi the wine maker is Salvo Foti, who is very respected in the Etna area and has worked for Benanti and Gulfi. The wine is 90% Carricante, 2.5% Cataratto, 2.5% Minnella,2.5% Malvasia and 2.5% Muscatella dell’Etna. The grapes come from four different vineyards. The vines are 60 to 70 years old and are bush trained (alberello). Salvo Foti has said that the alberello method is the best for growing grapes under the climatic conditions on Etna which are more like Northern Italy and very windy. There are 6,000 to 8,000 plants per hectare. Organic farming methods are used and the grapes are hand picked. Fermentation and aging takes place in stainless steel tanks. This is a wine with cirtus fruit flavors, good minerality and acidity with a nice finish and pleasing after taste. The name of the wine comes from the story of the Cyclops in The Odyssey by Homer. Odysseus and his men are captives in the cave of the man eating Cyclops. Odysseus offers the Cyclops, Polyphemus, some strong and undiluted wine in order to get him drunk. Polyphemus then asks Odysseus his name. Odysseus tells him “Οὖτις“, which means “no one” and the Cyclops promises to eat this “Nobody” last of all. With that, he falls into a drunken sleep. Odysseus had meanwhile hardened a wooden stake in the fire and drives it into Polyphemus’ single eye. When Polyphemus shouts for help from his fellow giants, saying that “Nobody” has hurt him, they think Polyphemus, it is very funny and go away laughing. 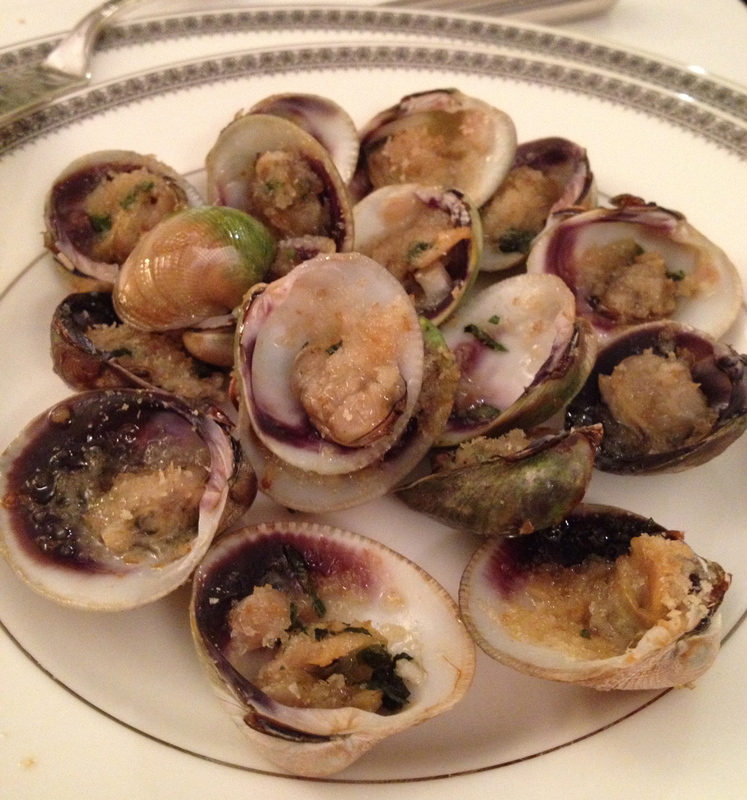 This was paired with another one of my favorites – Sautè di Vongole al Pangrattato — tiny clams steamed in wine then baked with breadcrumbs. 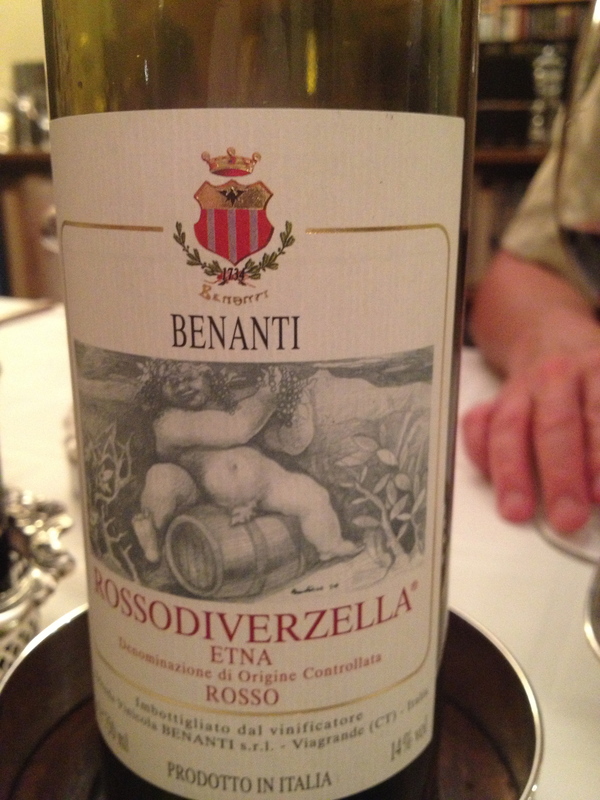 Etna Rosso Rossodiverzella DOC 2009 Bernati. Made from 80% Mascalese and 20% Nerello Cappuccio. The area of production is on the northern side of Etna in the commune of Castiglione di Sicilia. There is a lot of rain and high humidity with great temperature changes throughout the day. The soil is sandy, volcanic, rich in minerals with subacid reaction. There are 8,000 vines per hectare and the vine training used is the alberello. The harvest takes place the second week of October. There is traditional vinification and after malolactic fermentation the wine is aged is small casks- 225 liters-for 8 to 10 months. The wine remains in bottle for several months before release. This wine had red fruit flavors and aromas and a hint of vanilla that was not necessary. 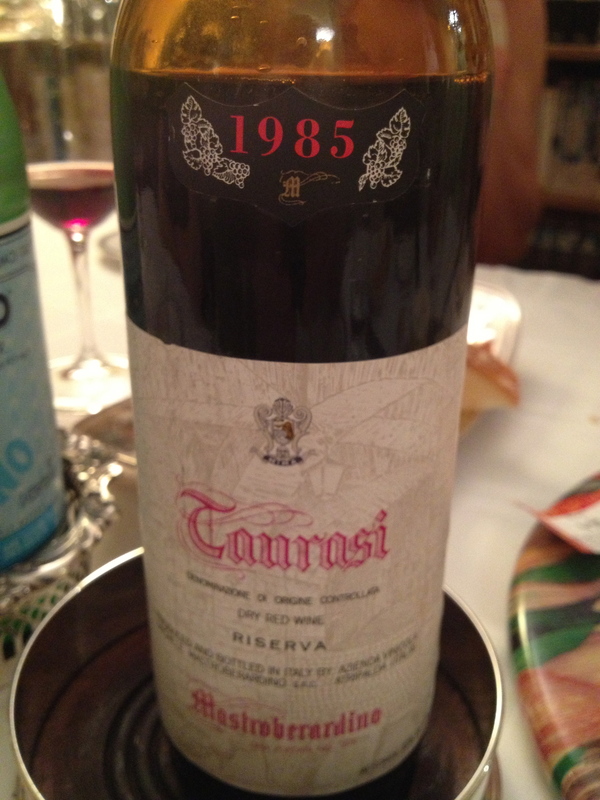 Taurasi Riservia 1985 Mastroberardino 100% Aglianico(Campania) Harvest takes place from the end of October into the beginning of November. The vinification is the classic one for red wine, long maceration with skin contact at controlled temperatures. The wine is aged for 24 months in Slovenian oak barrels and remains in the bottle for 24 months before release. This is full, complex wine with hints of plum, spice, coffee and a touch of leather. This is a great wine and I am very happy that when Tom did a non-Sicilian wine it was this one. Montalbano would have approved. 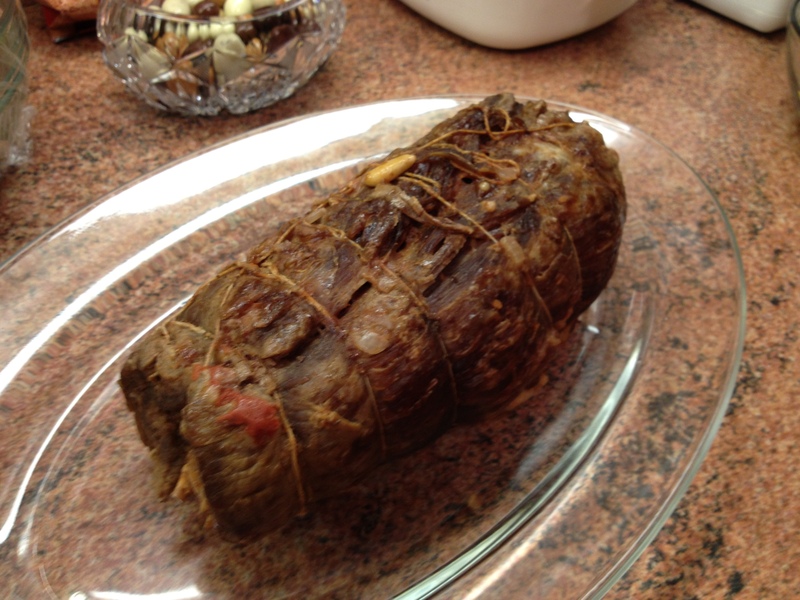 The two red wines were paired with Brusciuluni, a flattened piece of beef stuffed with cheese and salame, then rolled and tied like a roast. It was topped with a flavorful tomato sauce. I love that you all do this. 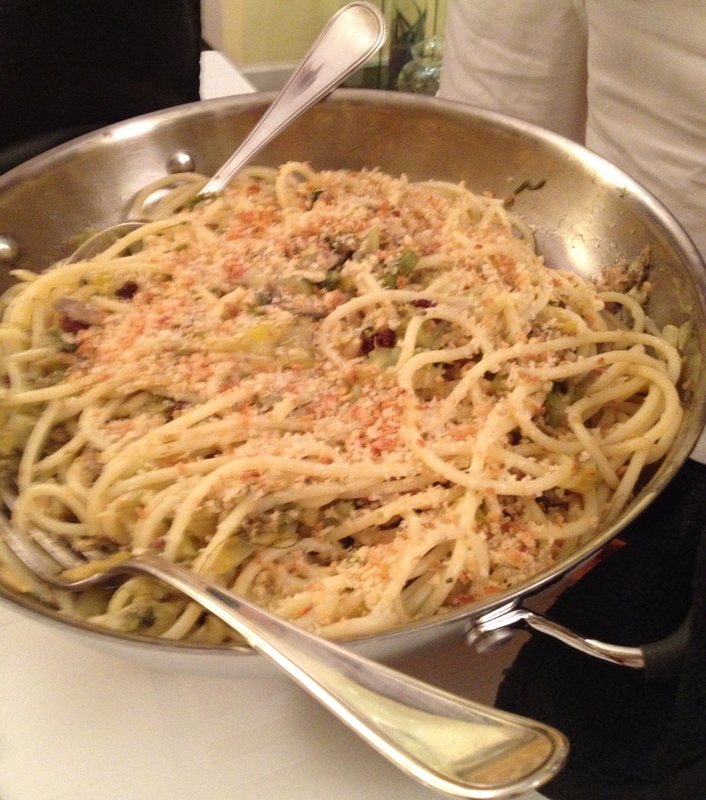 The Montalbano series is wonderful and always makes me want to eat the food….Complimenti!!! I really enjoyed this post. I’m a big fan of the TV show, “Il Commissario Montalbano,” which I watch here in FL on RAI. I enjoyed learning about these Sicilian wines. Cheers! You two are an inspiration. Thanks for sharing, and for prodding me to make more of my days. This is entirely BRILLIANT, Charles! I love this. And I am so envious that I wasn’t a guest! You should make a dinner series out of this. Wonderful! So envious! Btw Stephen Sartarelli, the translator of those books, is such a great translator! Ciao Jeremy, Yes I should and yes he is. Oh, but I am SO into learning about Italian wine, I can not TELL you how pleased I am to have found your site! The fictional town of Vigata in which the fictional character Montalbano works is based on the real town of Ragusa, and its seaside appendage of Marina di Ragusa.